“The eyes are the window of the soul." “But if your eyes are unhealthy, your whole body will be full of darkness. If then the light within you is darkness, how great is that darkness!" Out of the six senses, Vision is the most important of all. For a healthy Vision, healthy Eyes are of utmost importance. Eyes are one of the most complex organs in our body. We rely on our eyes to navigate and understand the world around us. With our eyes we look at various objects. Our eyes are such essential organs, through which we obtain 80% of our information. At Lumera, we believe that healthy eyes and healthy vision are of paramount importance for a healthy and blissful wellbeing. It is our constant endeavor,to help more and more people experience-The Power of “Healthy” Vision. 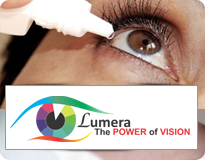 At Lumera, it is our constant endeavor to help people choose healthy vision with quality medicines, manufactured using state of the art,cutting edge technology. Our eyes might be small, but they provide us with what many people consider to be the most important of our senses – vision. Vision occurs when light enters the eye through the pupil. With help from other important structures in the eye, like the cornea and iris, the appropriate amount of light is directed towards the lens. Just like a lens in a camera refract (bends) light rays on to the filmthere by producing an image, the lens in the eye refracts (bends) incoming light onto the retina. 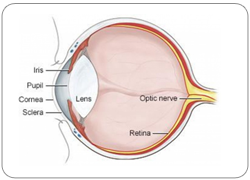 The retina is made up by millions of specialized cells known as rods and cones, which work together to transform the image into electrical energy, which is then transferred via electrical impulses by the optic nerve to the brain which processes it into an image. Human Eye, is one of the most complex organs of eye. It is vulnerable to a variety of diseases and Disorders like Dry Eye-in front of the Eye to sight threatening diseases like Glaucoma, ARMD in the back of the eye.